The PCH 1073 is the new generation of high quality low cost vibration monitors, which can be used for surveillance of vibration levels in machinery and detecting unbalance and bearing faults. The monitor operates within 2 simultaneously running frequency bands configurable 0.7Hz to 11.5 kHz. A primary low-frequency band monitors vibrations according to DIN/ISO 10816. 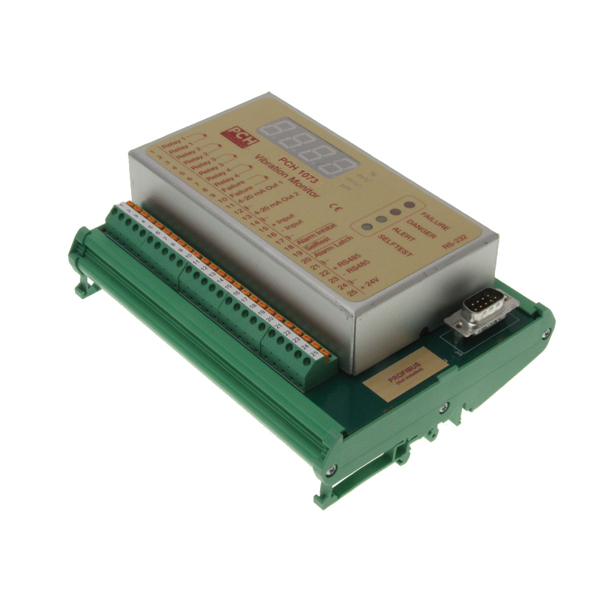 A second multi purpose band offers detectors as RMS, Envelope, Crest factor and Kurtosis, and is ideal for condition monitoring of roller bearings. It is possible from one transducer point to monitor both unbalance and bearing failure simultaneously. The monitor includes windows based software for parameter set up, time wave streaming and off line FFT. Several monitors can be connected by a RS-485 net.